On a quest to find only the best plastic coin holders? We’ve got you covered – below we list top 5 plastic coin holders that are quite popular among coin collectors. If you are new at coin collecting, it’s essential to know that storing your silver or gold proof coins in their original vinyl holders is not safe in the long run since this might result in coins damage over time. Choosing from the plastic coin holders listed below is recommended to preserve the value of your gold or silver coins. 1. Air Tite coin holders are the favorites among many coin collectors enabling them to fit coins of various shapes, sizes and denominations. Even if you are a proud owner of ancient odd shaped coins, the custom fit is achieved by picking the right foam ring that is inserted inside the Air Tite plastic holder. Both the plastic cover and the case, including the foam rings are manufactured from inert materials providing only the best protection from environmental coin damages. 2. 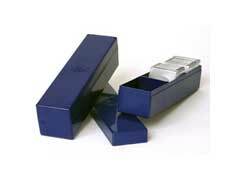 Kointain holders are museum grade non-PVC plastic shell like containers for long term and safer storage. Kointain holders provide superior clarity for displaying your precious gold coins and will not yellow like some vinyl coin holders allowing you to save money over time. 3. Coin World plastic coin holders are ideal for long term storage since these are manufactured from crystal clear acrylic and will not interact with gold or silver coins leading to their damage. These plastic coin holders snap tight to keep the dust and air out. Many numismatists also like how easy they are to open or close. 4. Coin Edge plastic coin holders are perhaps for the pickiest of the coin collectors enabling them to only admire the face and the flip side of the coin, but also the edges that are very often hidden in all other plastic coin holders. 5. Intercept Shield Holders are specifically created for storing your silver and copper coins. Special material neutralizers sulfur thus eliminating toning of the coins which could be especially beneficial for some collectors. The only drawback of these folders is the price which seems to run higher than its inert counterparts. As a side not we feel like it’s worth mentioning a Gold Eagle coin holder in particular. According to factory handling instructions, coin collectors are advised to use glue to permanently seal these holders because from time to time heavy coins might cause the holder to unseal. However, numismatic experts strongly caution against the use of glue since it may interact with coin’s surface and lead to its permanent damage. If you are looking for the best cardboard coin holders, scroll over to one of the other articles to see our list of top five.